In a new study, a team led by University of Utah biologists has discovered that different versions of a single gene, called NDP (Norrie Disease Protein), have unexpected links between color patterns in pigeons, and vision defects in humans. These gene variations were likely bred into pigeons by humans from a different pigeon species and are now evolutionarily advantageous in wild populations of feral pigeons living in urban environments. The U biologists analyzed the genomes of domestic rock pigeons (Columba livia) to determine the mutations that govern the four fundamental color patterns on pigeon wing feathers. They compared the default, ancestral "bar" pattern, named for the horizontal black stripes near the wing tips, against the slightly darker "checker" pattern, the darkest "T-check" pattern, and the lightest "barless" pattern. They found that a DNA sequence near the NDP gene was very different between bar birds and both T-check and checker birds. 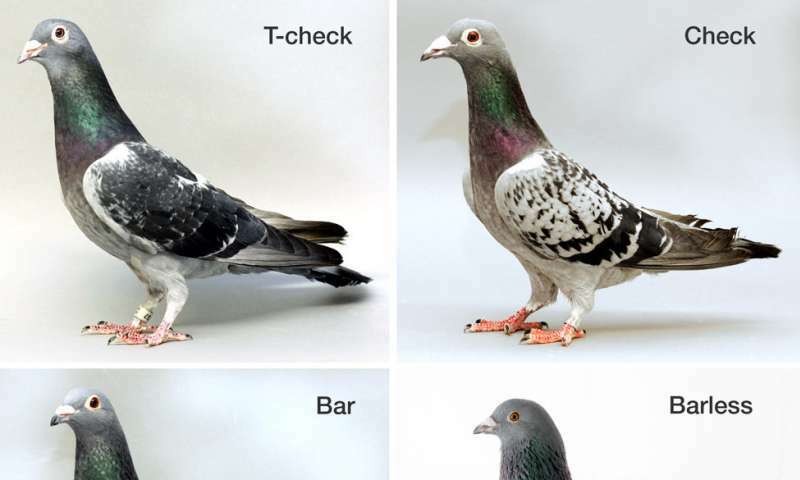 In addition, some of the T-check and checker pigeons have more copies of a stretch of DNA near the gene, resulting in even more pigment in their feathers. In all cases, the gene sequence itself is unaltered. In contrast, the least pigmented barless birds had a mutation in the gene sequence itself, which could affect its function. "That's pretty wacky. It's the same gene, but it's modified in different ways to get completely different results," said Mike Shapiro, professor of biology at the U and senior author of the paper. This is the first time NDP has been associated with pigment variation. Pigeon breeders have reported that barless birds have had vision problems for decades. This study discovered that the exact same NDP mutation found in barless pigeons is also found in two human families with hereditary blindness, suggesting that this part of the NDP gene is important in eye development. Previous research has shown that the darker checker and T-check birds have an advantage in urban environments; they have a longer breeding season and fledge many young out of the nest. The new U study found that the genetic changes associated with checker and T-check patterns probably resulted from humans breeding the domestic rock pigeon with the African speckled pigeon (Columba guinea), a wild pigeon species common in sub-Saharan Africa. A version of the NDP gene was introduced into domestic pigeons several hundred years ago, long after pigeon domestication. The implication is stunning. "Humans may have transferred a trait to another this other species that they had domesticated, and that trait is now out in the wild, where it is now advantageous specifically in human-created habitats," said Shapiro. "It's nuts." The study was published online on July 17, 2018 in the journal, eLife. Since domesticating the rock pigeon over 5,000 years ago, humans have bred more than 350 pigeon varieties in different colors, patterns, shapes and sizes. The humble street birds aided Alexander the Great in battles and helped Charles Darwin explain natural and artificial selection in "On the Origin of Species." Today, hobbyists drive most of the diversity within the species by competing for cash prizes and glory in breeding competitions all over the world. 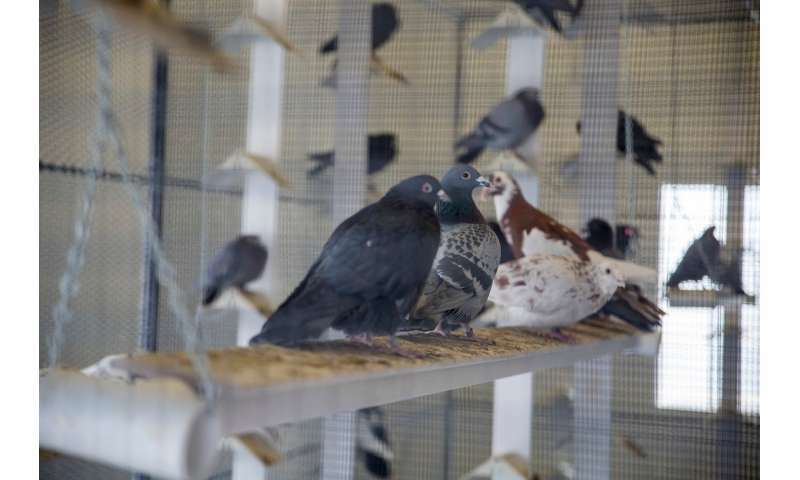 The researchers worked with the Utah Pigeon Club, the longest continuously running pigeon club in the western U.S., and the National Pigeon Association to get the blood samples necessary to investigate the molecular mechanisms driving diverse pigmentation patterns. In the early 1900s, geneticists first recorded that four fundamental color patterns were likely determined by variations at a single region, or locus, on a chromosome. Hobbyist have likely known about the basic genetics for much longer. "Pigeon breeders know what a bird might look like if you bring two different combinations together. Without knowing about the molecules involved, they know which physical traits are dominant, and which are recessive," said Anna Vickrey, doctoral candidate at the U and lead author of the paper. Vickrey and colleagues sequenced the genomes of the four varieties, testing candidate genes that might regulate different color patterns. They found that barless pigeons have a mutation in the NDP gene sequence itself that impedes pigment production. Then, they determined that the darker-feathered birds had more copies of a probable regulatory DNA sequence, which dials up expression of NDP in checker and t-check birds. "To see both changes in how much of the pigment gene is expressed, and changes in gene sequence in one suite of physical characteristics is kind of unique. It's definitely exciting," said Vickrey. "It turns out that how many copies of that DNA region you have determines how dark your wings are. So, this is a mechanism for evolution of traits like pigmentation by simply duplicating stretches of DNA. It's not really evolving something from scratch, it's taking what you've got and making more copies," added Shapiro. Although unknown in the bird world, the NDP gene is well studied in humans. Dozens of mutations in the gene result in blindness, deafness, schizophrenia and motor and intellectual problems. Yet the mutation in barless pigeons only affects their pigmentation and eyesight. At least two families in Japan with the same mutation in NDP experience only hereditary blindness. It points to at least part of the gene being important to vision. "We discovered this gene that hasn't been implicated in pigmentation traits before. It has these really interesting links to eye disease, so that implicated a common link between pigmentation and eye development that's worth following up," said Shapiro. 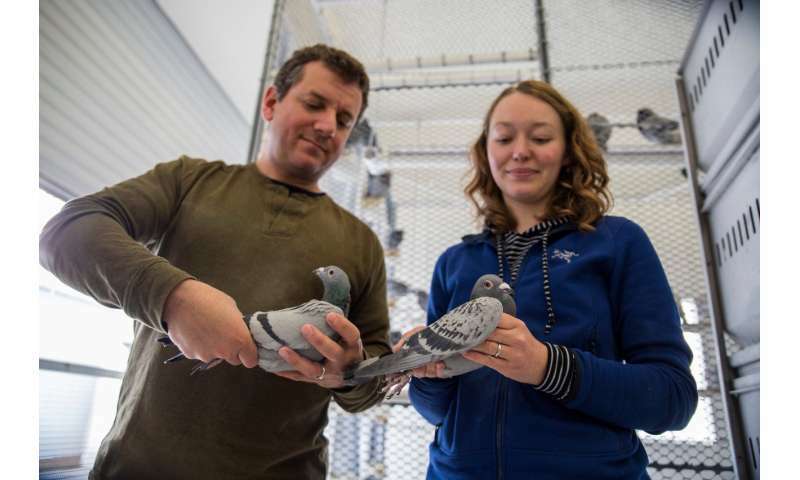 The researchers are collaborating with the Moran Eye Center at the U to study the veins and arteries behind barless pigeon retinas for insight into the NDP mutation's effect on eye development. Additionally, checker and T-check pigeons seem to have other reproductive and physiological changes that let them thrive in urban habitats. The biologists are investigating whether linked traits raise the possibility that NDP is changing not just pigmentation patterning, but also other important fitness traits. Like making Various Robots using the same metals, plastic etc. ....Not in Humans,though for a few decades. 1 President was born to a While Lady, looking of different race ! oh jeez be... Even for you that was an off-the-cliff incomprehensible rant of mindless gobbledygook! Congratulations, you have achieved the status of the bathyscaphe depths of trumpeting tweeting gibberish!